The Esprit can handle everything from jazzy noodling to angular delay-drenched alt.rock and classic R&B grind. Meaty high-gain voice. Feels chunky and dependable. Not the most inspiring set of clean sounds. Through Squier, Fender has a history of producing instruments that give the high-end USA guitars a genuine run for their money. Early 1980s Japanese JV Series Stratocasters now fetch considerably more than their original retail prices second-hand, while the much-missed nineties Vista Series was alt.rock heaven: original Jagmasters and Supersonics still provoke frenzied bidding wars on eBay. Just as we were recovering from being knocked out by the great quality and value of the Telecaster Customs, '51 and new Jagmaster, another set of new Squiers on the block arrived in the shape of the Master Series. This time around, however, Squier has strayed much further from the traditional Fender design staples and has moved towards twin humbuckers, shorter scale lengths and mahogany construction. Fender's early eighties Master Series included its first Esprit design, which was later endorsed by toneful jazz-blues maestro Robben Ford and superseded by his own signature model. 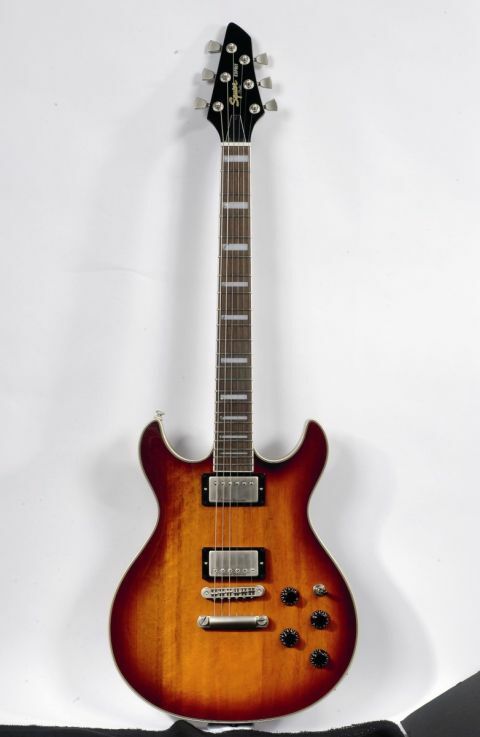 The original John Carruthers and Dan Smith-designed Fender Esprit featured an alder body with routed tone chambers and a figured maple top, but the updated Squier version is more understated and simply utilises a chambered mahogany body, while retaining the general vibe and attractive outline of the original. A revamped headstock outline, while still a three-a-side configuration, is less traditional than the original and reminiscent of Ibanez's now sadly defunct Talman series - albeit in mirror image form. A scarf joint secures the headstock and is just about visible beneath the neck's dark stain between the first and third frets. The dark red wine-coloured stain continues over the back and sides of the Esprit's body and the top is finished in antique burst, which reveals several slight cosmetic flaws in the mahogany. There's nothing too unsightly or unacceptable in this price bracket though. What appears to be a polyester gloss finish covers the entire guitar except the fretboard, and this contributes to a feel that's far from unpleasant. However, it's so commonplace among similarly priced Korean instruments that it does subtract a little individuality. With that in mind, there's a satin wine finish available if you fancy a rawer playing experience. The satin 'platinum' finished hardware and Duncan Designed humbucker covers lend a pseudo-aged, oxidised look that proved to be rather popular here in the Guitarist office. It works particularly well in conjunction with the classic sunburst cosmetics and the cream-tinted binding on the front edge of the body and the neck. The 22 jumbo frets are installed proficiently, with no rogue sharp ends exposed, and provide a platform for copious bending. Out of the box, the Esprit was somewhat undersold with a set of light 0.09-gauge strings. In combination with the shorter Gibson-like scale length, this made for a slightly slack and lightweight feel, albeit with plenty of lively resonance. However, any lack of depth is easily remedied with the extra mass that's provided by a heavier set of strings. The 'C'-profiled neck - maple according to Fender's spec, mahogany according to our eyes - and the comfortable top fret access provided by the soft contour of the ergonomic neck join combine to form an ideal platform for expressive lead playing. The Esprit's light unplugged character translates into an almost ES-335-like chime and clarity, which can only be symptomatic of its chambered construction. The twin Duncan Designed humbuckers sound very classy here, and we were impressed in particular by the neck pickup's dynamic lead voice and overall lack of muddiness. There's an inherently Fender-flavoured airy spank in the instrument's clean vocabulary, and a bright, lively character overall that helps lead lines and solos sing out, while ensuring that chunky chords don't degenerate into mush unless caked in the filthiest of saturated fuzz.